The space occupied by 317 has seen a lot of traffic over the past five years. It’s longtime inhabitant, the Brick Alley Grill, closed a few years back following a flood. Something called Checkers Cafe followed it, then a Persian restaurant called Parisa. This past fall, The 317 opened with a local heavy-hitting chef named Chance Bear and a Japanese-American fusion menu. It didn’t last long; Bear flew the coop for the aforementioned Bistro Elephant/Lemongrass. The reboot is called 317 at Montgomery. Part of the turbulence with this space the shortage of on-street parking, which is the only nearby option for diners. The other is the collection of churches ringing the neighborhood, including the Cathedral of the Immaculate Conception. The annoyingly regulatory state of New York’s “blue laws” prevent any new establishment within 200 feet of a church to serve liquor, though beer and wine are fine. We arrived a few minutes early for our 5:30 p.m. reservation, made on OpenTable. Parking delayed us as a series of one-way streets in that area don’t allow drivers to turn around or redirect their vehicles. After making a four-block loop to come back to Montgomery Street, I rammed my Honda Pilot into a snowbank and called it a win (4WD, you know?). After some confusion as to our name and reservation time, we were offered a seat in the front window or in the dining room. The Wife chose the former, which placed us aside an enormous plate-glass window. While the view of Montgomery Street was nice, the cold air radiating from it was not. We relocated to the back corner of main dining room. The Dining Week menu at 317 offered the choice of an appetizer, soup or salad, and an entree. Our waitress, who may have been on her first day of work, had difficulty explaining the ingredients of the winter vegetable bisque, describing it as “carrots, squash and a bunch of other vegetables.” She also struggled with the beer list, offering me the Southern Tier IPA, pronouncing it eye-puh, and Guinness drought as choices. I had the eyepuh. 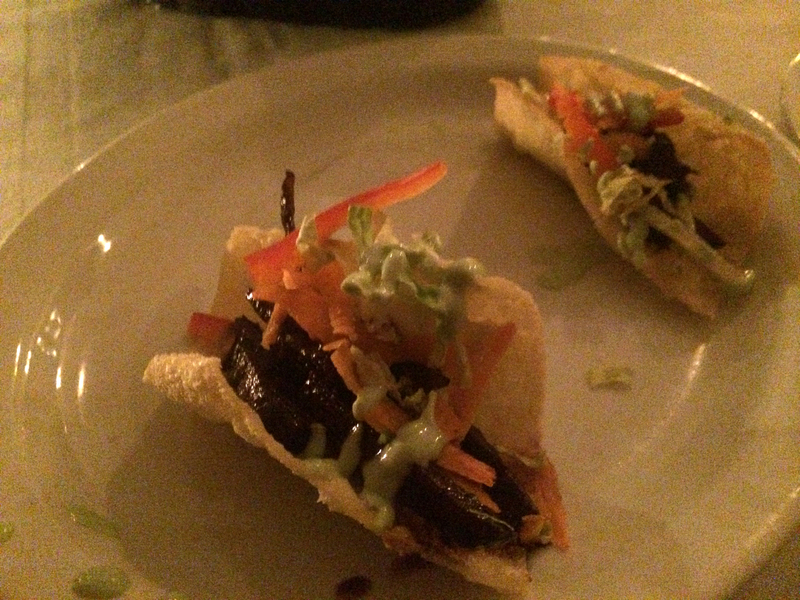 Appetizers included Asian beef tacos, calamari frites and crispy polenta topped with a mushroom ragout. Two fried wontons served as taco shells and were filled with shredded beef, probably made from the same brisket featured on the menu. Shredded Napa cabbage and creamy wasabi provided the Asian definition. Rather than serving as an accent, the predictably overpowering wasabi cream was heaped on, overshadowing every other possible flavor. The Wife enjoyed the mushroom ragout and fried polenta cakes, noting that the polenta stood up well to the sauce. A neighboring table seemed to enjoy their fried calamari, which was served three of what their waiter called ‘yo-lay.” During The Wife’s post-app bathroom break, I tried to figure out what a “yo-lay” was. After catching a peak at the plate, it occurred to me that there were three ramekins of aioli served with the frites. The second course allowed us the choice of a Caesar salad or the aforementioned bisque. The Wife’s salad was interesting, most notably since it was not a Caesar. Mixed greens were tossed with matchstick apples and dried cranberries in a balsamic vinaigrette. She was pleasantly surprised, seeing the salad as an upgrade over the tied Caesar salad. Still, the preparedness of the waitstaff — either on their own or by management — in serving the customer seemed nonexistent. 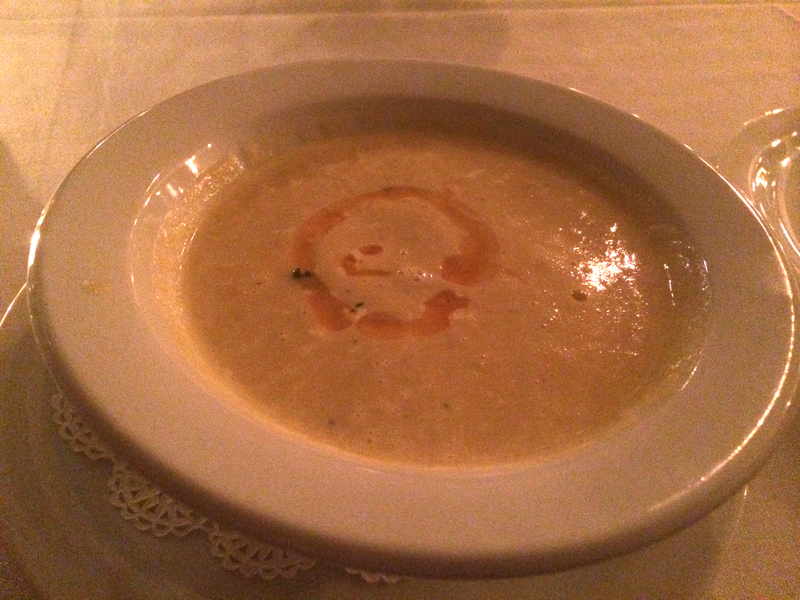 For a vegetable bisque, one might expect strong flavors of parsnips, carrots or potatoes. The medium-sized bowl of soup was heavy on black pepper and not much else. Even after balancing it off with table salt, I was hard pressed to find any vegetable flavor in the bowl. The presentation was nice, with a drizzle of squash-seed oil on top, but there was little else to write home about here. The four dinner choices presented a quandary when ordering. 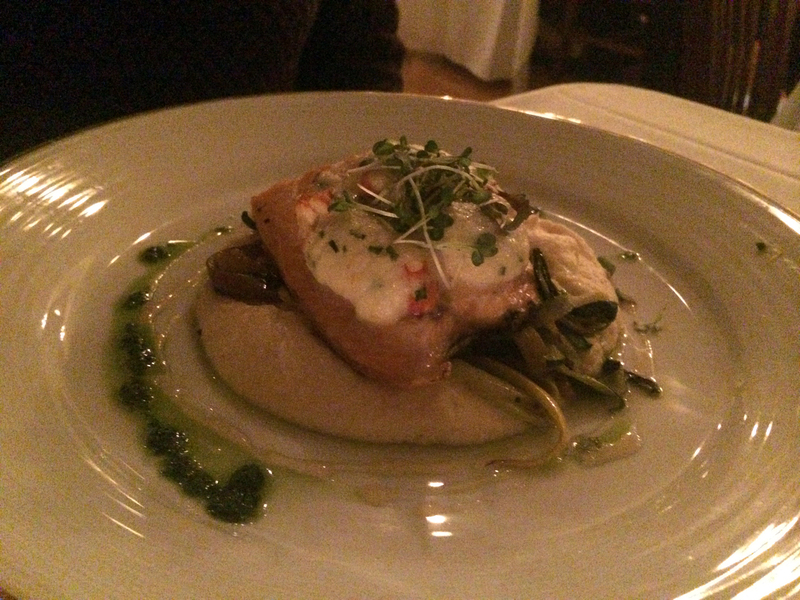 I do not particularly like salmon, which ruled out the lobster-crusted version served over a parsnip puree. I was leery of ordering duck from a “special menu” as I really like duck and don’t want to take chance with it on the cheap. The menu description of “UN” Spaghetti and Meatballs didn’t offer much, so I was left with the slow-cooked beef brisket. The Wife went with the fish. When one thinks of slow-cooked beef brisket, the mind often wanders to barbecue. Brisket, though, is quite good when braised. 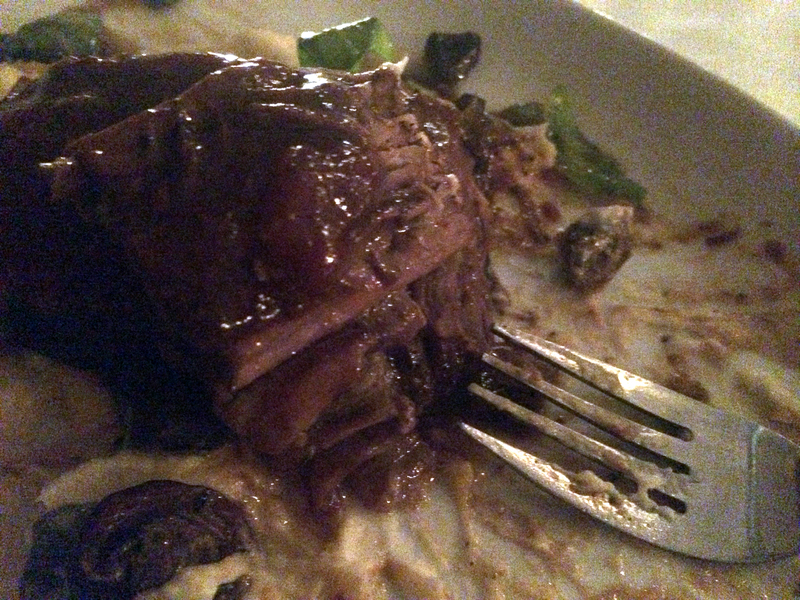 Fork-tender and prepared in an onion demiglace, this would have been the showpiece of the meal. But, the kitchen opted to serve this on a base of pureed parsnips. While I like parnsips, the spicy vegetable takes up a lot space in a spectrum of flavor. 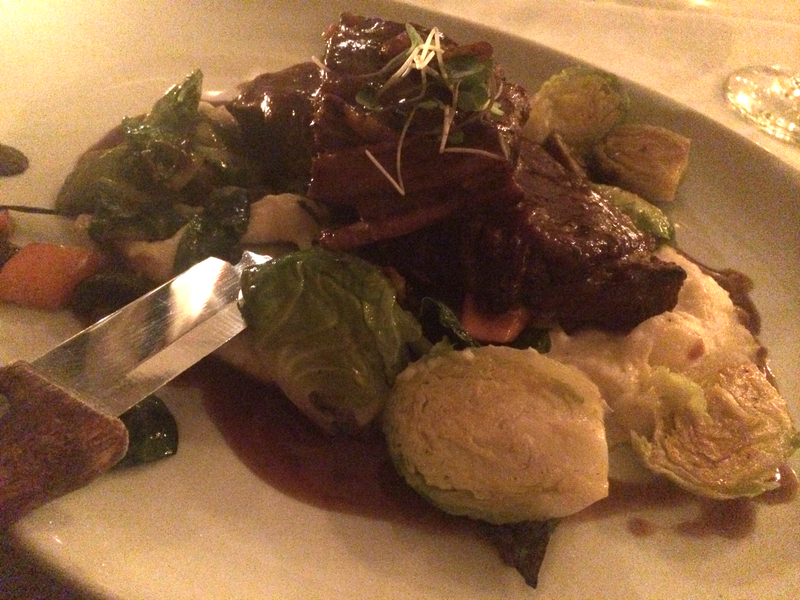 In this space, it overpowered the beef, Brussels sprouts and mushrooms on the dish. As a side, it would have been fine. As a potato substitute, it just didn’t work. The Wife enjoyed her salmon, saying it was okay, but experienced the same issue as I did with the parsnips. By the end, she had picked out all of the fish and left the bed of puree to be cleared. We skipped dessert. As I fetched my coat from the rack in the back of the restaurant, I passed by the waiter prep area. A Price Chopper grocery bag with loaves of bread sat out next to some baskets. This leads me to a point. The 317 at Montgomery bills itself as upscale dining (it says so on their Facebook page) and everything from its menu descriptions to its prices suggest it. When I think of upscale dining in Syracuse, I think about bc after it opened or Elderberry Pond. I think about Moro’s Table in Auburn or Asti Caffe. Upscale is not just serving food at high prices. It’s putting effort into making sure your staff knows what it is talking about. It’s spending time to make sure that the flavors in the $30-a-plate entree match correctly. Upscale means that there is quality control so that the food bears flavor. It’s about the little things, like saying you are open for lunch on Facebook but only listing hours and a menu for dinner on your website. Upscale is about detail, like buying your off-the-shelf website and making sure all of the links work correctly. Nitpicky? Yes, but details are details when you are Upscale. Upscale means that speaker wire doesn’t dangle from the ceiling on to the head of the person dining. And it means that your bread service comes from a bakery or, at the very least, is hidden in a non-public space. Upscale isn’t just expensive food; it’s an experience. The 317 at Montgomery is not upscale. The 317 at Montgomery is located at 317 Montgomery Street in Downtown Syracuse near Columbus Circle. 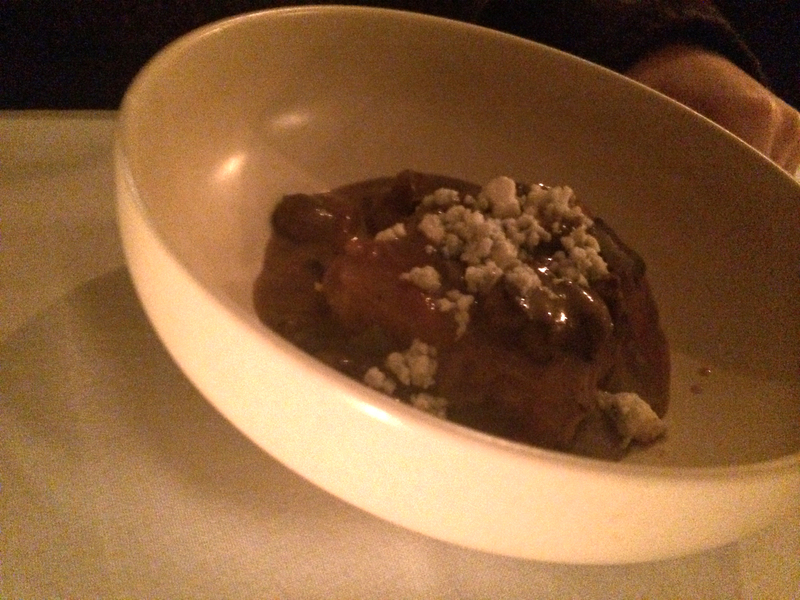 Reservations are accepted by phone and online for dinner from Tuesday through Saturday. Dinner and drinks was $70.20 before tip.